1. They don’t get stuck in the middle – Most curtain rods are made of two pieces, one of which slides into the other, leaving a bump, or seam, on which curtain panels often get stuck. In addition, if you need to hang a long rod you will need to put a supporting bracket in the middle that the curtain cannot go past. Curtain track brackets do not interfere with the movement of the curtain, and tracks can be mounted end-to-end to make a smooth continuous line that can be as long as needed. Thanks to carriers and other drapery hardware, curtains can be smoothly and easily drawn all along the length of a track without getting caught. 2. They can carry their weight, and more. Curtain tracks aren’t only supported at the ends; they are supported with brackets or other drapery hardware at regular intervals. 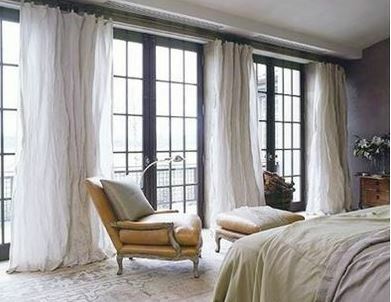 They can easily hold long, heavy drapes, without sagging, as some rods have been known to do over time. 3. They aren’t just for windows. Most curtain rods are designed to be used on windows - flat windows. Because curtain tracks can be mounted on walls and ceilings, and some are flexible (such as our 6100 Flexible Curtain Track), they can be used virtually anywhere for anything. If you need a curtain for a bay window or corner window, as a door, as a virtual wall, to cover your TV when not in use, or to create privacy in your cubicle, a rod is not going to get the job done. 4. They make your window look great. Curtain tracks give you many more decorative options than rods. Rods allow for one look, but curtains can be configured any way you like on a track. Some tracks, such as the 3120 Track can even be recessed into the ceiling, making it essentially invisible, and giving a seamless floor-to-ceiling look to the curtain. Drapery hardware such as our 84106 Wheeled Ripplefold Snap Carrier allows you to keep the curtain panel ripple-folded when opened or closed, something that is not possible with a rod.